Last edited by Cambium; 08-12-2015 at 05:31 PM.. So 1999 to 2013 for cold PDO. That has to be the shortest lived negative PDO in history. Bastardi and many others think summer of 2016 and the positive PDO is over and strongly negative after that. Previous negative PDO's lasted far longer than 13 or 14 years. It is supposed to be decades, not one decade. The last negative PDO was roughly 1948 to 1978. Maybe they are right about climate change, cause the Pacific looks awfully warm all over the place, and so do the Indian and Arctic Oceans. And it shouldn't be shifting to a positive PDO again already. Shouldn't happen for another 20 years. If PDO does stay strongly positive now for years, that would throw their whole theory about these decadal oscillations out the window. And here comes a cooling Atlantic. I was going to start a PDO thread but did a search and realized we had one already. May number is out and once again it warmed. Now 1.2. This link will update soon. nother temporary positive flip was, I believe, 1958 or so to 1961 or so. Am I wrong? Interesting that you should mention those dates. 1958 and 1961 were the hottest summers on record here. Well, until 2004 and 2015 jumped between them. Still, 1958 and 1961 were the worst fire seasons on record. In 1958 alone more than 2 million acres of forest burned in BC. 1958 and 1961 were bland here. The common thread is that both 1961 and this summer have featured scorching Septembers, at least so far. Wasn't 1957-8 a pretty strong El Niño? Wouldn't the Pineapple Express have caused the 1958 summer to be cool? 2004 had the fewest 33C (90F) days in NYC on record; only two, and the were 90 and 91 respectively. This summer is notable here for s so-far unbroken record of 59 consecutive days over 26.5C (80F). That streak will break on Friday after 62 such days. The Pineapple Express hits in the winter, namely November to January. By summer the weather patterns are much different with almost all the weather coming up from the hot US southwest desert.
" The positive Pacific Decadal Oscillation (PDO) regime, colloquially known as the "warm blob," has been a climate driver across North America over the better portion of the last two years. According to NCDC, it is described as "a long-lived El Nino-like pattern of Pacific climate variability. 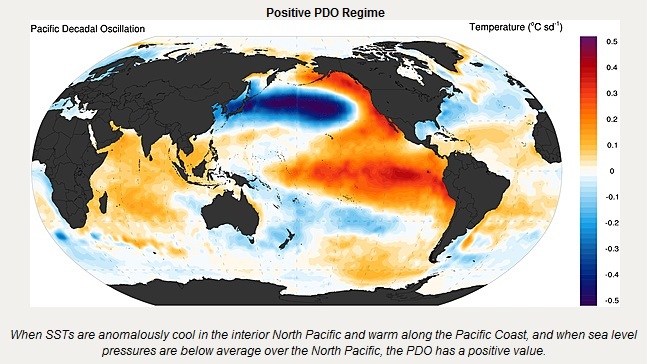 Extreme phases of the PDO have been classified as being either warm or cool, as defined by ocean temperature anomalies in the northeast and tropical Pacific." When the pattern is reversed, with warm SST anomalies across the interior Pacific and cooler SST anomalies near the west coast of North America, the PDO has a negative value. Prior to early 2014, the PDO had been largely negative since early 1998. Research from the Japan Meteorological Agency shows that the PDO has a period of about 20 years. The positive PDO has harbored North Pacific ridging, at times highly anomalous, during the 2013-2014 and 2014-2015 winters. Thus, the typical North Pacific storm track was disrupted, and extremely dry and warm conditions occurred in California and along much of the West coast. With a ridge focused over the western U.S., the East experienced persistent cold and precipitation in what was a highly amplified North American dipole pattern. The ridge of high pressure in the northeast Pacific kept SST above to much above normal there, which then caused more ridging -- a positive feedback of sorts. Given its influence over the past two winters, it is prudent to study its recent change/progression/intricacies and offer some thoughts on how it will impact the coming winter. We expect the PDO to have some influence this coming winter but probably not to the extent that it did over the last two. El Nino and its influences are expected to supersede those of the PDO. Real time data shows that the PDO has weakened in recent months as storms traversed the North Pacific. We expect this trend to continue into winter. Occasional flexes of a western ridge are possible over the course of the winter, with most modeling suggesting that late winter (especially February) holds the biggest risk for this. Arctic air could be funneled into the Midwest and Northeast when this occurs, and, should it meet a southern branch storm system, we could be looking at a good deal of snow."